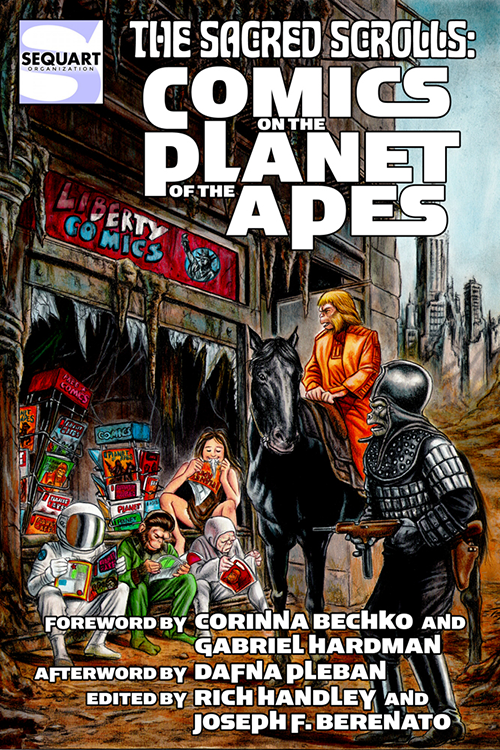 I received an email a few weeks ago announcing Sequart has published a new book called The Sacred Scrolls: Comics on the Planet of the Apes. Being a big Apes fan, I had to check it out, and was given a review copy in return for an honest review. It's a great addition to any bookshelf for a die-hard Apes fanatic. Of particular interest to me, of course, were the chapters on Marvel Comics Planet of the Apes magazine from the 1970s. I have written a few articles on this topic myself, over on Giant-Size Marvel. I loved Doug Moench and Mike Ploog's Terror on the Planet of the Apes series in particular, in Sacred Scrolls there is a great chapter written by Sam Agro which recaps this series and offers some insights from Moench. Agro appreciates all the same things about Ploog's artwork in the early issues with an incredible ink wash style, then the later issues published from his full pencils. Zaki Hanson has a great overview of Marvel's adaptions of each the Apes movies and I had forgotten that for some of the sequels, Moench had included scenes taken out of the movies. John Roche covers Moench's Future History Chronicles series that was drawn by Tom Sutton, which was just mind blowing at the time. Both Roche and Agro reveal what would have happened if Marvel's POTA magazine had not been cancelled (and apparently that cancellation wasn't because of sales but licensing): more twists for the Terror series and a replacement strip for the film adaptations, Journey to the Planet of the Apes. Funny enough, I had discovered this myself back in 2009 and forgot, but take a look at my original article on GSM with links to this material. It's a great trip down memory lane for the Marvel material, then Rich Handley and other authors cover how the Apes were handled at Malibu, Dark Horse, BOOM!, etc. I am not such an Ape fanatic to stick with it through all these iterations, but I found the BOOM! chapter to be the most interesting. I love Gabriel Hardman's work and his work (along with his wife Corina) on the Apes and reading that chapter was cool. One thing I discovered which blew me away - the variant covers on the Prime Directive mini-series, Gold Key homage covers feature both the classic Apes and Star Trek! The one above was for issue #4 featuring good old Chuck Heston. 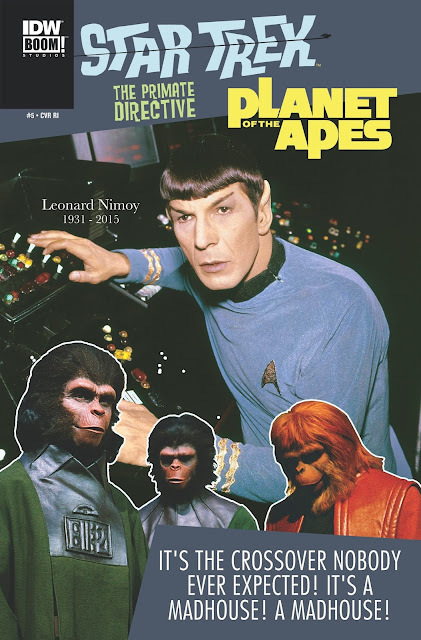 The fifth issue has a cover featuring Spock, Dr Zira, etc. I remember Gold Key comics fondly, I hardly ever bought the regular comics but often did buy the digest sized books like The Twilight Zone. 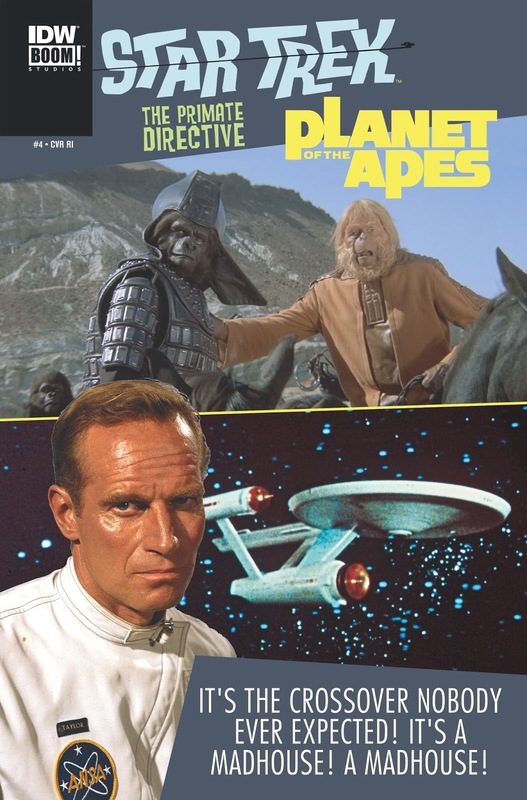 Gold Key published many Star Trek comics and I had assumed they were the first ones to publish POTA. The Sacred Scrolls has the details on that - in short they did the first Apes comic ever, but it was just an adaption of Beneath the Planet of the Apes. Any chance to dip back into Apes nostalgia is a good time, and Sacred Scrolls has lots of trivia to keep Apes fans happy for a few hours. Nuff Said!